The road trip continues this week with a four-game series in Houston. The last time the Yankees visited Minute Maid Park, the stakes were quite a bit higher. Yankees pitchers held the Astros to a .187/.271/.294 slash line … which made the Yankees’ .205/.274/.347 line look positively stout in comparison. Aaron Judge raked in the ALCS, slashing .250/.357/.708 with 3 HR and 7 RBI. Those three home runs represented 30% of the homers in the series as a whole. Masahiro Tanaka was in full-blown ace mode in his two starts, pitching a 1.38 ERA and allowing just 9 baserunners in 13 IP. Unfortunately, Justin Verlander was not to be outdone. He tossed 16 innings of 0.56 ERA ball in his two starts, allowing just 12 baserunners while striking out 21. Verlander was named the ALCS MVP for his efforts. Check out Katie’s Yankeemetrics post for more interesting notes from the ALCS. Houston has been incredibly healthy so far, and their disabled list is populated by a couple of relievers (Brady Rodgers and Jandel Gustave) that are recovering from 2017 elbow operations. Neither is expected back until this Summer. 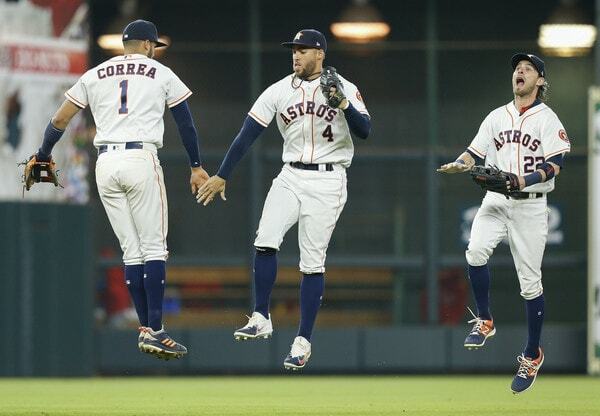 The Astros are 19-10 with an MLB-best +66 run differential. Their success has been largely due to fantastic pitching, as they’ve allowed an MLB-low 81 runs in those 29 games. What makes that even more incredible is the fact that the only two teams within 10 runs of the Astros (the Red Sox and Diamondbacks) have played just 27 games. And the fact that they’re fourth in the league in runs scored and fifth in wRC+ is simply icing on the cake – this team is an all-around juggernaut. Max Stassi (129 wRC+) will probably get at least one start behind the plate, probably with Jordan Montgomery on the mound; Evan Gattis (72 wRC+) will get at least one start at DH; and Jake Marisnick (20 wRC+) will probably get a start in center. After years of injuries and inconsistent performance, Morton put it all together in 2017, his age-33 season. He pitched to a 110 ERA+ in 146.2 IP, with stellar strikeout (26.4%) and groundball (51.8%) rates. Through five starts it appears as though that wasn’t even his final form, as he has a 212 ERA+, 29.4% strikeouts, and 59.2% grounders in 29.0 innings. There’s quite a bit of season to go, so it’s premature to put much stock into those numbers, but it’s clear that the Astros did quite well with their 2-year, $14 MM investment eighteen months ago. Morton is essentially a three-pitch guy, with a mid-90s four-seam fastball, mid-90s sinker, and knee-buckling curveball representing about 90% of his offerings. He’ll also mix in a cutter and a splitter, both of which check-in in the upper-80s. 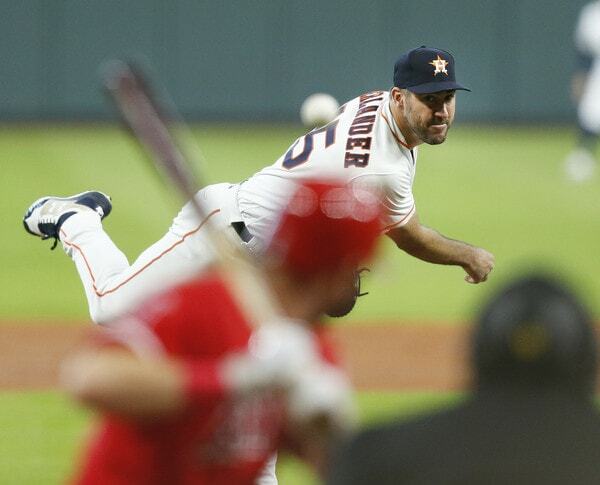 It would not be a stretch to say that Verlander has been the best pitcher in baseball since joining the Astros. The 35-year-old has pitched to the following ridiculous line in 17 games (including the postseason) – 110.1 IP, 60 H, 21 BB, 129 K, 1.55 ERA. He also has a 13-1 record if you care about such things. Verlander looked toast in 2014 and was hurt in 2015, but he’s been stellar over the last two-plus seasons. Verlander is largely the same pitcher he’s always been, stuff-wise, featuring a mid-90s four-seamer, a mid-80s slider, and a low-80s curve. Don’t sleep on his changeup either. Keuchel has been the weak link in the Astros rotation so far, with a 4.00 ERA (99 ERA+) in 36.0 IP. That’s not quite bad enough to make me forget how dominant he has been against the Yankees, though – Keuchel has a 1.59 ERA in 62.1 IP against the Yankees, including three playoff starts. The Yankees did get the better of Keuchel in Game 5 of the ALCS, scoring 4 runs in 4.2 IP against the southpaw, and getting to the bullpen early. Keuchel is a five-pitch guy, with three fastballs in the high-80s (four-seamer, sinker, cutter), a low-80s change-up, and a high-70s slider. Thursday (2:10 PM EST): RHP Masahiro Tanaka vs. RHP Lance McCullers Jr.
McCullers is in his fourth season in the majors, despite being just 24-years-old, and he remains a tantalizingly promising pitcher. The trouble has been that McCullers has dealt with a litany of injuries, which limited him to 118.2 IP in 2017, and 81.0 IP in 2016. His strikeout (27.0%) and grounder (55.1%) rates have been elite every year, but he needs to prove that he can stay healthy. McCullers is a four-pitch pitcher, featuring a mid-90s four-seamer, a mid-90s sinker, a mid-80s change-up, and a mid-80s curve. His curve is his best pitch, and he throws it just under 50% of the time. Houston has been running a fairly unique bullpen this season, embracing something resembling a closer by committee. Hinch uses Chris Devenski (0.75 ERA), Will Harris (1.69 ERA), and Ken Giles (2.00 ERA) as firemen/bullpen aces as opposed to picking a traditional closer, and it has worked out quite well so far. Collin McHugh (0.84 ERA) is the long man, and Brad Peacock (2.84 ERA) and Hector Rondon (1.74 ERA) are the middle relievers. The Yankees dealt Brian McCann to the Astros in November of 2016 to completely free-up the catcher position for Gary Sanchez, and I don’t think either team regrets the move. Sanchez is amazing, and McCann has put up 2.3 fWAR in 115 games as the Astros strong-side of the platoon catcher. These are two of the best teams in baseball – what more do you need?